Combative Emails: How Do We Respond? Last Sunday you preached a real challenging message, taught a Bible class that really challenged a long-held traditional belief on a particular passage, made an announcement that is not appreciated by everyone, etc… Now you open your church email account and in your inbox is one of those emails. You know the kind of email I’m talking about… The email comes from a church member who means well but nevertheless is chocked full of emotion and criticism, correcting your wrong interpretation of scripture with enough proof-texts to create a topical index of the Bible. I call them combative emails because they’re usually the critical kind of emails that are screaming for a combative response. Let me say that again: Don’t! Sympathetically, I don’t envy you one bit. I’ve received my share of combative emails during my ministry. It’s easy and very tempting to fire back a response, defending your message and correcting this person’s take on things. That’s a natural reaction because for many people, including myself, our response when challenged is to go on defense. But I have learned that this is normally a poor-defensive strategy and one that is likely only to create further problems. So what should the response be? Wait awhile! The first and most important thing you can do is wait. Give yourself some time to think and reflect on what the person is and is not saying. This way you avoid making a reply that is emotionally reactive and likely only to make matters worse. Let it go! Not every battle is worth fighting. This is true of any relationship, like our marriages and it is certainly true for ministry as well. Some issues are not worth the time it takes to discuss them and sometimes, the battle is not worth the price it will cost in the end. Furthermore, there’s not much wisdom in discussing a matter with someone if that person has proven themselves to be unreasonable and close-minded. Tell ’em thanks! In most cases, the writer of an email like this would at least like to know that you received the email and read it. So a short and simple reply telling the person “Thanks!” will help a lot. You might even suggests that after having some time to think about their concerns more, that perhaps they would like to get together and talk over some coffee or lunch. In all likelihood, the person who sent you the email just wanted to be heard and this will oblige him or her while defusing something that could become very disastrous. And use discretion about any further engagement by emails. Talk face to face! There are occasions where things are said and done that must be addressed. Whether it’s a misunderstanding, an accusation, or else, if it is possible then the best way to handle the matter is to arrange a time to sit down and talk face to face. Generally, I think it’s ok to arrange such a meeting by email or phone but that is it. Save the discussion for some conversation over a good cup of coffee or a warm bowl of soup. In this way, by seeing each others face, you remind each other that this is a conversation between two Christians and that allows you to speak in ways that builds each other up. These I have learned the hard way… And I’m still learning. There is one more suggestion I have and it has to do with fostering immaturity. I have found that these combative emails of reflect immaturity on the part of the sender, especially when the emails are accusatory and are full of incoherent arguments that proof-text the Bible at will. It’s unfortunate that such immaturity exists among Christians but the greater tragedy is to foster such immaturity by resorting to the same tactics in response. My suggestion is don’t! By doing so, you are simply telling the other person that it’s ok to act this way and it will not serve any purpose except to create more problems… including a giant headache. There have been a couple of occasions, where I refused to even respond and acknowledge my receiving of an email, choosing instead to go directly to that person. If they can’t handle that then there isn’t any conversation to have on the matter they want to address. So what suggestions do you have for responding to people who send combative emails? There’s a part of me that wants to post this because regardless of what you think about Chick-Fil-A’s moral stance on gay-marriage, their Christian convictions also means doing good deeds too and that should not go unnoticed. This is also a reminder of what a little kingdom imagination coupled with kingdom values can result in if we are willing to be the hands and feet of Jesus Christ. Try playing a little more offense! 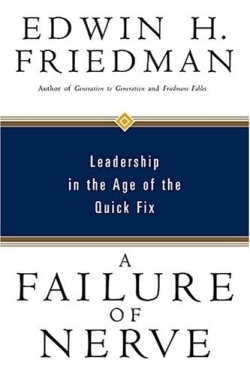 I’ve started reading A Failure of Nerve: Leadership In The Age of the Quick Fix by the late Edwin H. Friedman. This book has been recommended to me on several occasions by several ministers. I’m only one chapter in and my mind is already bursting with thoughts and reflection on my own leadership as a minister. Think about this, instead of reacting defensively to the challenges and complaints, Friedman writes, “You have to get up before your people and give an ‘I Have a Dream’ speech” (p. 21). Hmmm… What would it look like if church leaders stopped playing so much defense and instead went back to playing offense? When churches would rather live with insanity. Seriously though, this is a real issue. I’ve heard many churches say that they want to grow and then, when I ask them what will have to change for that to happen, there is nothing but silence. The classic definition of insanity is doing the same thing and expecting different results. That also describes many churches when it comes to growth, regarding evangelism and ministry. These days, as Christmas approaches, we here a lot about how consumeristic the holiday season has become and for good reason. But there is another side to Christmas. My daughter, Caryn, will turn 9 in two weeks. She currently receives a weekly allowance for various chores she does around the house. Like most children, she’ll also receive more than enough Christmas presents as she does every year. However, this year, without any prompting from her mother and I, she asked if she could go shopping to buy a few gifts for people. So tonight her mother will take her Christmas shopping. As I thought about this, it reminded me that there is a side of Christmas — a good side — that is about giving. So this also becomes another great opportunity to teach our children about the blessed joy of giving. Peace is coming. . . One Day! If you watched the 2013 Iron Bowl, Alabama vs. Auburn, then you know that the kicker Cade Foster didn’t have a good day; he missed 3 field goal; Auburn upset Alabama, ending the hope of a BSC title for the Crimson Tide. In the after math, Cade Foster received brutal criticism from fans, including death threats. Enter former U.S. President George W. Bush, who sent this letter to Cade Foster. Agree or disagree with Bush’s politics, this was a class act. Sometimes, the gift of writing a letter, thank-you card, or note goes along way! So is forgiveness and reconciliation possible? 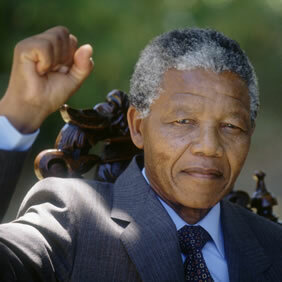 If you know the legacy of Mandela, then you know it’s possible. More importantly, Jesus Christ was crucified that we may be forgiven and reconciled with God and one another. The resurrection of Jesus is the promise that we have nothing to fear in forgiving others and being reconciled to one another. You can read Paula’s article and many other good articles on the renewed Wineskins website which is up and running now. Any ways, when churches understand that restoration is about the resurrection of Jesus Christ, the game changes!